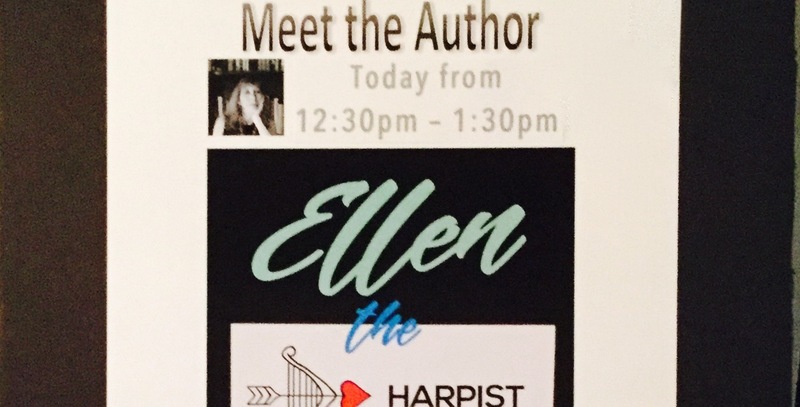 My friend Kelly, proprietor of the Michigan Harp Center, hosted my first Ellen the Harpist book event at her booth at the Somerset Folk Harp Festival yesterday. She was one of the winners of my e-book release day raffle three weeks ago. We both happened to be in Atlanta at the American Harp Society National Conference when the contest ended, and I visited her booth to congratulate her. I mentioned that when I returned home, I would be readying “Ellen the Harpist” for release as a paperback. Connecting to me through my giveaway gave Kelly the idea to hold a book signing at the Somerset Folk Harp Festival. Back home, she contacted me on the day I approved the files for the paperback. I loved her suggestion, but I worried it was one I couldn’t bring to fruition because my bulk order of books was not due to arrive until July 25, two days too late. Willing the books to arrive early, I copied and pasted the tracking number for the shipment into the shipper’s tracking box so many times, my iPad grew bored and threatened to load Pokémon Go just to get me to do something else. My queries were futile. My package existed only as a shipping label at its point of origin. Around 8:30 this past Wednesday, 35 pounds of books landed in my breezeway, giving my dog reason to bark and me cause to cheer. I made a poster. Kelly and I littered social media with news of the event. And yesterday morning, 35 pounds of books, a poster, and I headed off to the Somerset Folk Harp Festival. I’ve been asking Google and Twitter to tell me how to sell books. They say one of the most important things an author must do prior to launching a book is build an author platform. I wrote a book about a harpist. I connect with harpists throughout the year as a member of the board of the American Harp Society and at local events, big conferences, and on social media. I had a platform. But platform is such a, I don’t know, wooden-sounding word. At my book event, I spent time talking to Toni. I lovingly blame her for my existence as a harpist. She and my mother went to high school together. When my mother was ready to cave in to my year of relentless begging for harp lessons, she planned to reach out to Toni for a teacher recommendation. Before she made the call, the two of them ran into each other at our local Shop Rite. I saw Robbin and her mom, fixtures in my harp life since I was seven years old. Robbin got stuck watching me during the day when we travelled to Dublin and London with our harp teacher the summer when I was 10. And here were Aideen and Odarka, other friends from my teacher’s studio. I saw Faye, the first subscriber to my blog. And Lauren, one of my students. John and Tom, ensemble mates from when I used to goad harpists into playing in my harp ensemble. Anne, whom I got to know better at the AHS conference a few weeks ago. And Constance, a winner of a copy of my book in a raffle Robbin held at her workshop the day before. And harpists I met for the first time at the book event. I connected to my author platform at the Somerset Folk Harp Festival . Its members listened to me read, asked questions, and bought books for me to sign. My platform is friends I’ve met between my first harp lesson and today. People I support who make me feel strong and supported. My platform is a community. I sent each person home with a book, but it was a book they helped me write because before I was an author, I was a harpist, just like them. And I am grateful for my community of harpists, my author platform.